D.W. McMillan EMS is the emergency service provider to Eastern Escambia County, Alabama covering 665 square miles. There are two full time ambulances always in service, staffed with a paramedic and an EMT. D.W. McMillan EMS provides 24/7 service 365 days a year to the citizens of Escambia County in coordination with Escambia County E911. 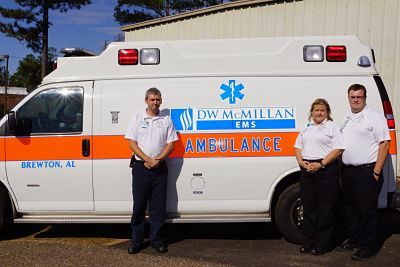 D.W. McMillan EMS has highly trained, well skilled personnel in pre-hospital emergency services. The D.W. McMillan EMS fleet consists of three box trucks and one van, used in hospital transport.